OK, Every Book Has A Bad Issue…. And this appears to be one…Just when the whole Court of Owls thing was really heating up and the book was cooking, we get an introspective stinker like this one. 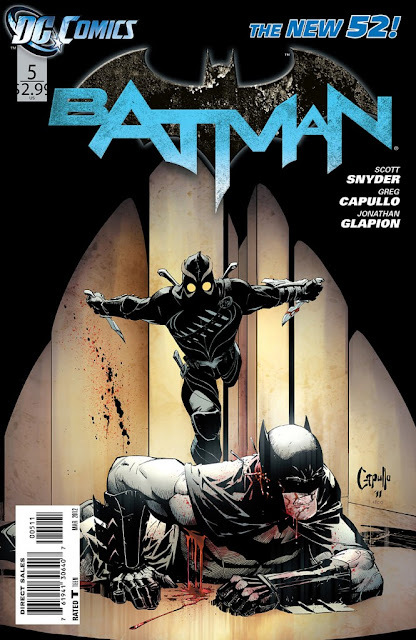 Batman has been captured deep in the bowels of Gotham by the Court….where he is subjected to wandering a maze, filled with pictures and moments of Gotham and his own life. Meanwhile, every Bat character is on the lookout for the whereabouts of the one true Dark Knight. In fact, Batman has been missing for a week, and folks are getting worried. While all this is going on, Batman is wandering physically and mentally. He is losing control. He is having hallucinations while trying to figure out a way out and the key to the mystery of this court of owls. While being stalked in the maze by the Talon, the court’s assassin. Good times! The layout and setup of the book run off the rails when you have to start turning a book around to read it properly, and are worried that maybe there is a printing error. I guess it is an attempt to show the depths of the madness, but it is rather pointless and frustrating. Seeing Batman broken so quickly; it just doesn’t make sense. Eight days? Come on now. It took weeks for Bane to break him. So, this issue, take it as an aberration. Even the art gets a little too maddening at times. I don’tknow what they were after here, but it looks a little too much like Seinkiewitz’s “I AM SPIDER” covers from the 80s when Parker was thrown in the looney bin. Too abstract. However, the story continues to be the star as we are left wondering…how will Bats get out of this one, and…who are the Court of Owls?